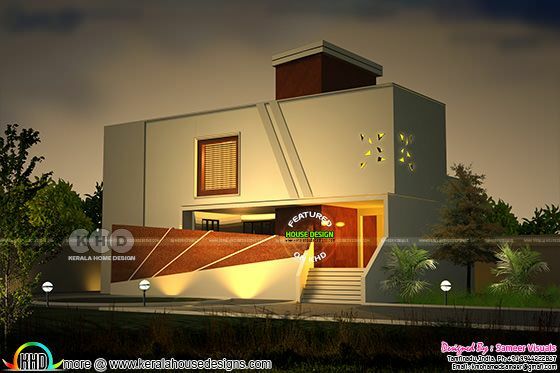 3250 Square feet (302 square meter) (361 square yards) 4 bedroom new age house plan architecture. Design provided by Sameer Visuals, Tamilnadu, India. Inside, an open concept floor plan is prominent smoothly connecting the living and dining areas. The spacious kitchen has a large island with seating next to the double-height family theater. A large guest room and full bath complete the ground floor. Upstairs, the master suite has a private deck, huge walk-in closet and a private bathroom with double vanities. A sitting area, three more bedrooms and two baths complete the first floor. 0 comments on "New age house plan by Sameer Visuals"